Audio books are tough. First, they're expensive so I often take a chance on the Audible Daily Deal just because they are such a good deal. After all, I go through dozens of books a year in audio format and I can't afford to spend $10 to $20 for every one of them. The library helps, but their selection is weak. Besides, sometimes I luck out and find a real gem (Scott Meyer, Drew Hayes, Dennis E. Taylor) that I would never have discovered otherwise. Still, when you buy a book just because it's cheap, you take a risk of reading something you don't like much. The other side of audio books is it's a lot harder to sit through a bad audio book than it is to skim through a bad print book. You can't skip long, boring paragraphs of description. You can't look ahead to see if it gets better. And the slowness! Oh. My. Gosh. Audio books are so slow. Even at 1.75 speed, it's slow. I can read faster than I can listen so even a good book can tax my patience sometimes. There are few things more frustrating than listening to a bad book, and even a mediocre book can be painful. That brings us to this one. 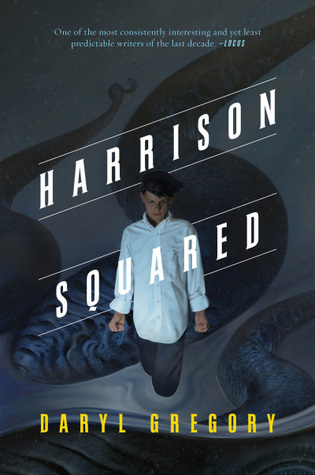 Harrison Squared was never going to be a favorite of mine. I don't care for Lovecraft at all and when books are too weird, they lose my interest. I can handle a lot of fantastical elements in my books, but they have to be believable on some level. Lovecraftian books break that believability with levels of weirdness that don't even try to seem plausible. It's like listening to a story told by a second grader - nothing makes any sense. This one started out depressing and dark and just got worse. I disliked the setting, I disliked the main character, and I hated the tone. Then, it takes an odd jaunt to the side into screwball comedy and that's where it lost me entirely. If you're going to write horror, commit to it, don't descend into hi jinks and quirky sidekicks. The tone was so uneven that, if it had been a road, the potholes would have been the size of the Grand Canyon. I have no problem with humor mixed in with horror, but it has to fit and this did not. Despite everything, I might have forgiven the book a lot if it had landed the ending. It didn't. It fell as flat as a cow patty and was just as unappealing. Look, I get it, horror calls for a downturn at the end, but this wasn't even a downturn. It was more like the metaphorical road from before just petered out into a gassy swamp. There was no payoff for all that came before. Lesson learned, I need to be a little more discerning about which Daily Deal's I pick up. They may not cost much in terms of dollars, but these are hours I'm never going to get back and that's too costly for me.